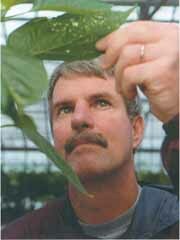 Jeffrey B. Jones’ recent research focuses on identifying sources of resistance to bacterial plant pathogens, particularly the Xvc virus bacterium that affects tomatoes and peppers worldwide. Jones has identified genes for resistance to this pathogen that have led to improved breeding strategies for tomatoes in Florida. He has also developed reliable detection methods for bacterial pathogens in seeds, weeds, roots and shoots. Jones’ studies on the epidemiology and ecology of bacterial spot and speck diseases have been of great use to the tomato industry in areas where bacterial speck is found. Another important research contribution by Jones centers on the use of bacteriophage, viruses that infect bacteria, as a biological control for bacterial diseases on tomatoes. “As a result of this work, bacteriophage are now successfully applied to plants to control bacterial spot on tomatoes,” Jones says. “This work clearly demonstrated that the bacteriophages provided significantly better control of the disease in greenhouse and field production than the standard bactericide application, copper.” Jones has generated more than $900,000 in grants in the last five years from the U.S. Department of Agriculture, the Florida Tomato Committee, the American Floral Endowment and other agencies.